The Bristol group met May 21st to hear Marta Costa give an excellent talk on what is new in cytology. This covered normal cytologic features of the ovary, cytology of hepatocellular carcinoma and an overview of a number of new techniques to optimize use of a cytology sample. 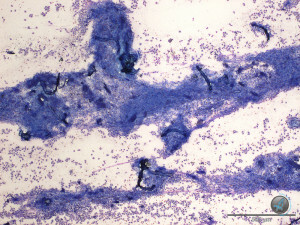 These included techniques to lift the smear allowing division between a number of slides to enable multiple IHC or special stains, new cell transport media and the production of cell blocks. Members then shared interesting cases which included testicular interstitial cell hyperplasia (?) in a cat, cytology of feline progressive histiocytosis, dacryoadenitis presenting as nodular conjunctival masses in young cats, and a case of septic peritonitis as a consequence of intestinal obstruction and rupture due to a tennis ball. 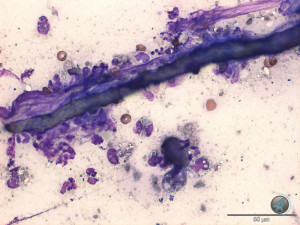 The peritoneal cytology with fibres from the disintegrating tennis ball (see image below) was a highlight of the evening. Thankyou to Mike for providing the image of the tennis ball fibres.